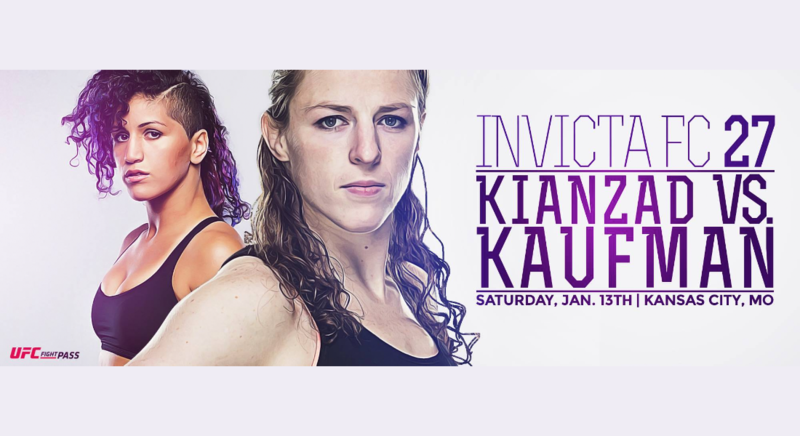 Invicta FC 27 opens the year with their first card on January 13th, 2018. Sarah Kaufman (18-4-1) makes a return to the promotion in the main event since her win over Leslie Smith in 2013. Kaufman looks to make a statement in efforts to get back on the UFC roster. But she’ll have to get through former Cage Warriors champion Pannie Kianzad (8-4) who is looking to pick up a win after back to back losses. A national shootfighting champion, Kianzad was set to face then-champ Tonya Evinger for the title in 2015 before the bout turned into a catchweight. A win over veteran Kaufman could put her back in title talk. Vanessa Porto’s previous opponents include Cris Cyborg, Roxanne Modafferi and Germaine de Randamie. She faced Barb Honcak for the inaugural Invicta flyweight championship. Mariana Morais fought eight times in the year of 2014. Sharon Jacobson is a two time National Champion wrestler. Her opponent Ashley Nichols is a Muay Thai Federation title holder. Tiffany Masters’ nickname is ‘The Rainbow Renegade’ and a flag is often worn proudly at her photoshoots and/or during her walk in. In 2015, Invicta FC picked Felicia Spencer up in mind for their new 155lb lightweight division. Loma Lookboonmee has more than 300 fights in Muay Thai, Wushu, and boxing.